Education is a cornerstone of AFB's strategic focus—with good reason. Making sure students who are blind or visually impaired can learn alongside their sighted peers is fundamental to giving them equal opportunities, so they can live and work with no limits as adults. AFB President and CEO Kirk Adams knows first-hand how vital education is to future success. In a recent speech at the Braille Challenge awards ceremony celebrating the national winners and finalists in this braille reading competition, he shared his own experience learning braille after losing his sight at age five. "I had already learned my print letters, but losing my vision meant starting all over again," Adams says. "Whenever I'm asked to name the most meaningful person in my life, I think of my teacher, Mrs. Summers, who taught me how to read and write braille." He was a diligent student, learning braille quickly with encouragement from his teachers as well as his parents and family, who took him to the braille library and bought him braille books. At the Braille Challenge ceremony, Adams reveled in his conversations with the students there, who share his lifelong love of reading. "I was a voracious reader and I learned a great deal, including how to absorb information and become an excellent speller—because I was actually reading instead of listening to recorded books," he says. "The literacy aspect of braille is just one of the reasons why AFB will always advocate for braille instruction." In addition to braille literacy, AFB is pushing for vitally important improvements to America's educational system. AFB is advocating to transform the way students who are blind or visually impaired learn, by ensuring that trained teachers instruct them in the skills that make up the Expanded Core Curriculum. ECC skills include braille, orientation and mobility, assistive technology, independent living and sensory efficiency, all of which are vitally important to studying, working, and living independently. During his speech at the Braille Challenge awards ceremony, Adams pointed out that the students' ECC skills are preparing them for bright futures, by teaching them the qualities employers seek, such as problem-solving skills. "I was so impressed with the exciting careers these young people are dreaming of," he says. "They want to be biologists, journalists, authors, actresses and vocalists, inventors, doctors, attorneys, engineers, mathematicians, software developers and more—all jobs blind people are doing today. As Braille Challenge finalists, they have already shown they can do anything they set their minds to." AFB also wants to ensure that all students with sensory disabilities are properly identified and counted. This will help AFB and its partners, including families of children who are blind or visually impaired, better advocate for adequate state and federal funding for the services and learning tools students need. AFB's advocacy for funding and policy improvements is supported by AFB's research, which will help the field better understand the educational needs of students. AFB is currently researching how many students are receiving braille instruction—and how many aren't, but should be—as well as evaluating the quality of braille instruction students receive. "People who are blind, especially children, have a lot of limits placed on them," Adams says. "The ability to read and learn are among the most powerful assets someone can have in trying to navigate through limitations and barriers." For Stephanie Enyart, AFB's new Chief Public Policy and Research Officer, the personal is political. Which is excellent news for all the people AFB's pursuit of social and systemic transformation benefits. Enyart brings nearly 20 years of experience advocating for people with disabilities to this newly created position, but she also has a personal connection to the work: Enyart became legally blind when she was a teenager and her husband has been blind since birth. "I've spent my entire adult life working in disability advocacy and policy spaces, and as someone who has a visual disability this is one of the biggest opportunities I can have to work on things that mean something to me," she explains. "All of my work and volunteer experience over two decades has pointed toward doing some sort of systems change work, and I feel like this is where I can make the most significant impact." Enyart, who graduated from the UCLA School of Law, was most recently the Disability & Inclusion Advisor at the Corporation for National and Community Service. Other previous experience includes advocating for the disability community as a Skadden Foundation Fellow for Disability Rights Advocates in Berkeley, Calif., and the Judge David L. Bazelon Center for Mental Health Law in Washington, D.C. Enyart has worked with state and federal government, as well as nonprofit, community organizing and political advocacy groups. At AFB, Enyart is tasked with uniting AFB's public policy and research work in support of the organization's strategic plan and its key focus areas of education, employment and aging. This includes building a Public Policy and Research Institute within AFB to conduct evidence-based research and serve as a collaborative resource for researchers in the field of blindness and visual impairment as well as emerging fields. "We want to be a thought leader in producing knowledge and creating awareness, as well as shaping institutional policy and practice," Enyart says. "We also want to be a touchstone for policymakers to understand what policies should look like and how they'll impact the lives of people who are blind or visually impaired." In her first few months at AFB, Enyart has been bringing together AFB's staff of policy and research experts, and reviewing AFB's portfolio of policy and research work to determine how AFB can make the biggest impact moving forward. "I'm part of a generation of people who don't see that there are any limits to a personal or professional life as someone with a significant visual disability," Enyart says. "I'm honored and very excited to work with AFB to help shape institutional policy and practice to create a world of no limits for everyone." If you want proof that people who are blind or visually impaired can do anything they set their minds to, look no further than Team Sea to See, which competed in the 2018 Race Across America (RAAM) in June. AFB was a lead sponsor of the team, an eight-person team on four tandem bikes—and the first-ever RAAM team with four blind stokers, which are the cyclists on the back of a tandem bike who add power to the cycling pilot in front. RAAM challenges individual cyclists and relay teams to ride from the Pacific to the Atlantic in record time—nine days or less. Team Sea to See completed the race in seven days, 15 hours and three minutes. But participating in and completing the race was only the beginning, says Jack Chen, who co-founded the team with Dan Berlin in 2017. Their goal was to challenge people's perceptions about the capabilities of people who are blind or visually impaired, which they will continue to do with a documentary film being created about their experience. "Everyone on the team gets to a point in this race where they push against their own upper limits—emotional, psychological, physical—and everyone goes beyond it in order to finish the race," says Chen, who acknowledges the invaluable contributions of the team's 20-person crew. "People who are blind or visually impaired push past our own limitations that way every day to live in a world that's made largely for a sighted population. We want to have a broader conversation about expectations, limitations and employment opportunities for people who are blind or visually impaired." Last fall, AFB and Comcast commissioned a survey of people who are blind and visually impaired, to better understand TV-watching behaviors and the impact of accessible technologies. What did they learn? A majority of people who are blind or visually impaired watch four or more hours of TV per day—almost as much as the general public. Less than half of the people surveyed were aware of assistive technologies like video description and talking TV guides, although those who were aware of the tools found them helpful. What Does the World Look Like to You? Jack Chen is the co-founder of Team Sea to See (read related story). He has run nine marathons, climbed Mt. Kilimanjaro and completed two Ironman triathlons. An attorney for Google, he holds 40 U.S. patents. Chen serves on the boards of several organizations, including Lime Connect, an organization rebranding disability in the workplace, and Aira, a technology start-up that created a visual interpreter using smart glasses for people who are blind. When did you first experience vision loss? Vision loss came for me in two stages. I was born with sight in both eyes, although very limited—I could see colors and large objects. By the time I was in high school, I had lost my remaining sight after a series of corrective surgeries that did not go well. What surprises people about your life? People are the most surprised by their own expectations about what people who are blind can do. When people say, "It's so amazing that you did X, Y and Z" what they may be actually saying is, "I had no idea that blind people could do X, Y and Z." I'm very grateful for my experiences and opportunities, but if I wasn't blind there wouldn't be as strong of a reaction to the things I've accomplished. Have you ever been in a situation where people tried to put limits on your aspirations because of your visual impairment? How did you have to advocate for yourself? I don't think anyone has consciously denied me something because of my blindness, although the National Conference of Bar Examiners would not let me take the bar exam on a computer. I really had to advocate and although they denied my request, it made me work extra hard to make sure I did not screw up the bar exam when I took it on cassette tape. What I have experienced, though, are the limitations people subconsciously put on people who are blind or visually impaired, because of their lesser expectations—the idea that we are somehow less able to achieve great success or be in charge or rise to the occasion. What do you wish more people understood about what it means to be blind or visually impaired? That people who are blind seek opportunities to succeed, and yes, fail. When I walk down the street with my cane, I walk very quickly. Sometimes people will grab me and stop me before I get to a wall. What might not be obvious is that I will discover the wall when my cane encounters the wall. If I'm being sloppy, I might not be careful, and sometimes, I may crash into the wall. I would prefer to discover the wall on my own, and if I mess up, the next time I'm walking around, I'll make sure to be extra careful. We need to be left alone to succeed and fail, and in our own failures we'll learn how to be successful. What advice would you give people who are blind or visually impaired about living with no limits? Being blind or low vision is not by any means a limitation. Of course, there are challenges to work through, but look at the people on Team Sea to See. They're successful businesspeople and athletes who have looked beyond the expectations that have been put on them and they've broken through. It's not unique to them. It's something anyone can and should do. 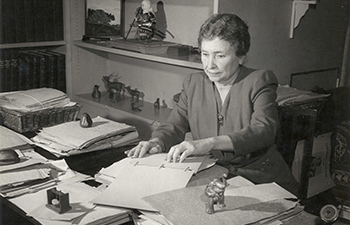 Amid much fanfare, AFB officially announced the launch of the Helen Keller Digital Archive in mid-June. Comprising more than 160,000 artifacts, the Archive is the world's first fully accessible digital archival collection, and is the largest repository of historical content about Helen Keller, the world-famous author, political activist, and humanitarian. Available at afb.org/HelenKellerArchive, this momentous online project was generously supported by the National Endowment for the Humanities (NEH) and American Express. Due to their fragility, many of the items in the archive were unavailable to the public until now. Helen Keller served as AFB's ambassador for over 40 years, and today, she remains a guiding light. Enormous thanks to AFB Archivist, Helen Selsdon, who led this groundbreaking project. AFB depends on champions like you to create a world with no limits for people who are blind or visually impaired. Right now, any gift you make will be matched, and worth twice as much to AFB! Please make a donation today to help level the playing field for all who are blind, or visually impaired. Your generosity helps provide visually impaired children the cutting-edge resources and tools they need to thrive alongside their sighted peers, educate employers and expand job opportunities for blind and visually impaired individuals, and work to pass legislation dedicated to bringing equality to the more than 25 million visually impaired Americans. Right now, your donation will be doubled—please support AFB in creating a world with no limits! Thank you!